The Twins are full of frustrating players right now, but Francisco Liriano might actually be at the top of the list. He even looks frustrated with himself, but of course that's what is so maddening. He found himself in mid-May, back when he was throwing to Rene Rivera, but Rivera was (justifiably) sent down when there was a roster crunch. Still, I can't help but wonder if Rivera is the secret sauce that Liriano needs right now. Coming into last night's debacle, Lirino had made nearly an equal number of starts with Drew Butera, Joe Mauer and Rene Rivera behind the dish. But the results have been vastly different. Liriano has posted a 5.26 ERA with a 1.449 WHIP throwing to Butera. He's been even worse with Mauer, with a 6.19 ERA and a 1.753 WHIP. But with Rivera, he's been Cy Young: 2.89 ERA and a 1.125 WHIP. Jason Repko is the sixth outfielder on the roster and third center fielder. The only reason he is still on the roster is that he's out of options, but at some point he turns from reserve to hostage. Can you justify carrying him for another 4 weeks just so you maybe keep him in the offseason? And even if you did lose him, wouldn't the cost to replace him be minimal? Yesterday Jose Mijares was not brought in to pitch an inning when the Twins had a 37-run lead. Scarier? That was totally justified. He's also out of options, and again, I can kind of see keeping him around just so you can try him out again next season. But really, why? Is there any hope next year is any different? Has any year been much different for him? He hasn't been a serious setup option since his September callup. Tsuyoshi Nishioka has turned into my whipping boy lately, I'll admit it. But seriously - put the poor kid out of his misery. He looks like he would actually be relieved to be sent down to Rochester at this point. I might even consider dropping him to New Britain if he continues to insist on using this slappie left-handed approach versus southpaws. I suspect the plan was to wait for Casilla to come back, but Tolbert can play there and Plouffe can sub in a pinch. Last night was the kind of game drives Gardy to the industrial-sized bottle of cherry extract, so I wouldn't be shocked if we see some roster changes regardless. But seeing as the Twins have repeatedly tried and failed to get Liriano's head on straight this year, doesn't it make a little sense to at least try that which has already worked? Especially when so little is to be lost? The concept of a 13-year-old facing a spiritual dilemma feels odd, but there it is. This upcoming year, my Chatty Chatty Princess faces the daunting task of attending weekly confirmation classes without much belief in a higher power. I know she’s going to attend – I still hold that much control - but I don’t know how her quest will end. My hope would that she finds what I found: an unseen love and magic worth holding onto. 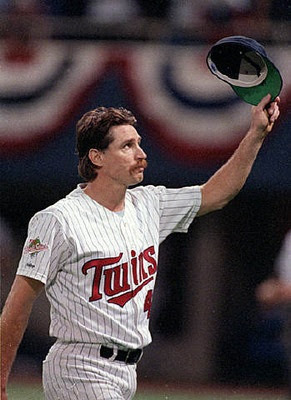 I’ve seen that magic a few times in my life and one of them concerns the 1991 Minnesota Twins, who are being honored this weekend at Target Field. It seems like an appropriate time to share that story, but first I need to talk about the ‘87 team. My fandom for the Twins has ebbed and flowed, but the needle had inched back to “obsessive” in the mid-80s. During spring training of 1987, I decided this year might be different, that it might be special. However, I watched the summer unfold with mixed feelings of delight and dread. My favorite team was seemingly sprinkled in fairy dust, but I knew that I was destined to miss the culmination of years of loyalty. That’s because the 1987 season would end during the fall of my junior year in college. Nearly a year before, I had applied and been accepted to study abroad - and not just abroad. Since the foreign language I was studying was Russian, I was studying in Krasnodar, a small rural city in the Soviet Union. I left at the end of August and would not return until December. To say I felt isolated there was an understatement. First, there were the challenges of being abroad: not really knowing anyone other than a group of students, not knowing the language particularly well, and not knowing a completely different (and ridiculously inefficient) culture and economic system. People ask me what communism was like. You know how before Christmas you go to the post office, and there is a huge line and there are only two windows open even though you see all kinds of other postal employees around? And you wait and wait and get angrier and angrier and then just as you get to the front of the line, he CLOSES the window because it’s time for his break and you have to wait that much longer? It was like that. Only for EVERYTHING. Then there was the group of students I was with. To this day I have trouble putting my finger on the dysfunction that surrounded that group. Most were friendly enough, but there was a pretension that seeped through most interactions and poisoned the waters. It added to the isolation. And finally, there was the fact that we were in the freaking USSR in 1987. The whole philosophy was one of isolationism. There was no internet or email. A phone call took 30 minutes to connect, cost $10 per minute, had to be made in the middle of the night, could only be made from hotel phones AND that was only if you could get the Russian operator to understand what you wanted. In the four months I was there, I managed to speak to my parents once – and their big news was that my dog had died. There also wasn’t any news of any kind from outside the Soviet Union. You can be sure that Pravda wasn’t promoting a lot of US news. Ditto any newscasts, though it’s not like TV was much of an option anyway. Anything mailed from the U.S. took three weeks to arrive. You would send a letter home with a request or question, and hear back a month-and-a-half later. So following the Twins pennant race and postseason run was a bit of a challenge. Near as I could tell, there were two other baseball fans on the trip: John (who was another Twins fan) and Nina (who happened to be a Cardinals fan). Anyone who called home was required to get several pieces of information from their parents to report back to the group – and two of those were the status of the Twins and Cardinals. My only real connections home were the occasional packets of newspaper clippings and John. We spent most of October together scheming ways to get news. One of us would get a mail package and we would both digest every story, every inch. We found out from other students’ phone calls that the Twins had won the first two games versus the Cardinals. We found out from a later phone call that they had lost the next three. We deduced the Twins had won game 6 by bringing a radio to the top of the hotel and trying desperately to get Radio Free Europe. Through 20 minutes of static we heard two words: “game seven” and that was enough. We found out the winner three days later when Nina got through on a pay phone to the Marine barracks in Moscow. John and I celebrated with Nina and my girlfriend and some cold bottles of vodka. John was my tether to baseball, and I was his. But when our trip abroad ended, I never saw John again. Except once. 1991 was a different story. I was out of college with a good job, and was crazy about this girl I was dating from Philadelphia. She and a mutual friend were visiting for the weekend of Games 6 and 7. We were all baseball freaks, so we found ourselves walking around the Metrodome in the frigid weather, trying to scalp tickets. $85 apiece seemed like a lot to pay to sit two rows from the top, but the girls were cold, so we hustled into Game 6 rather than risk losing that chance. Obviously, that was the best $85 I ever spent. The girlfriend (who later became my wife) changed her ticket to fly back a day later so we could watch Game 7. I was so worked up about the game I failed to make any arrangements to see it with friends. So we sat in my apartment on the living room couch and watched the tensest game I’d ever seen. It had been a long weekend, and this really wasn’t her team. As the sun went down, she laid down on the couch to watch, her head on my lap, eventually falling asleep. So now I was trapped. Inning after inning of nervous energy with no release. No eating. No drinking. No pacing. No talking. I was every bit as isolated as I had been in the USSR, maybe more so. It was an agony I could not escape. There was nothing to do but see it through. 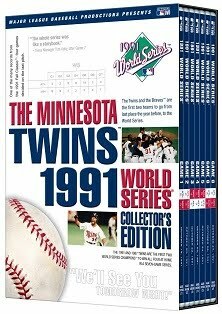 Minnesota Twins 1991 World Series Collecter’s Edition DVD Set which include all seven games recorded in their entirety plus bonus footage. I guarantee that you’ll be struck by all the drama that you had long since forgotten. This was not a series for the feint of heart. They run $69.95, which is considerably less than I paid for that Game 6 ticket. The Minnesota Twins 1991 World Series Collector’s Edition is for those of you with more of a life – it smushes all of the drama into a one-hour-and-fifteen minutes disc. It’s also just $19.95. I’ll choose two of them at random sometime Friday morning. I can’t imagine getting more than a dozen or so such tweets, so I think your chances will be pretty good. If you win, I’ll send you a direct mail message and then send your address to MLB to send you the DVDs.